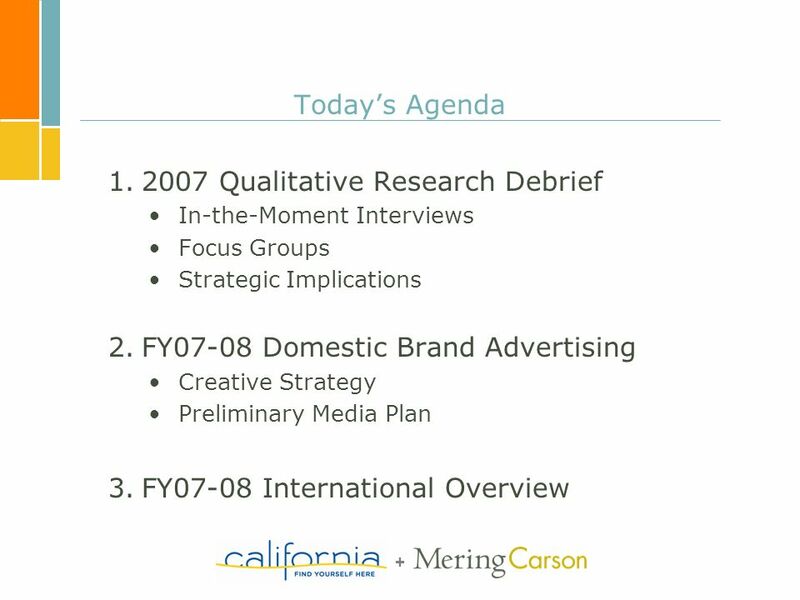 1 California Travel & Tourism Commission Advertising Committee Wednesday, May 2, 2007. 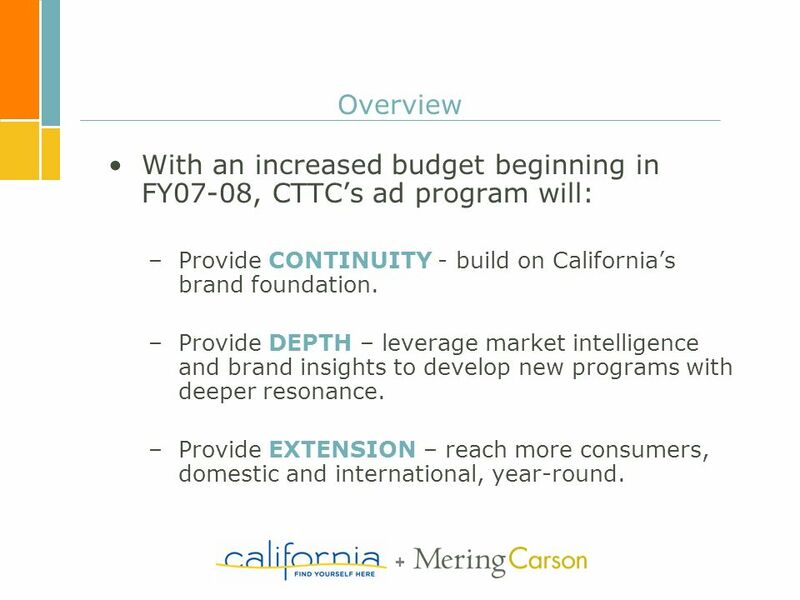 3 + Overview With an increased budget beginning in FY07-08, CTTCs ad program will: –Provide CONTINUITY - build on Californias brand foundation. –Provide DEPTH – leverage market intelligence and brand insights to develop new programs with deeper resonance. –Provide EXTENSION – reach more consumers, domestic and international, year-round. 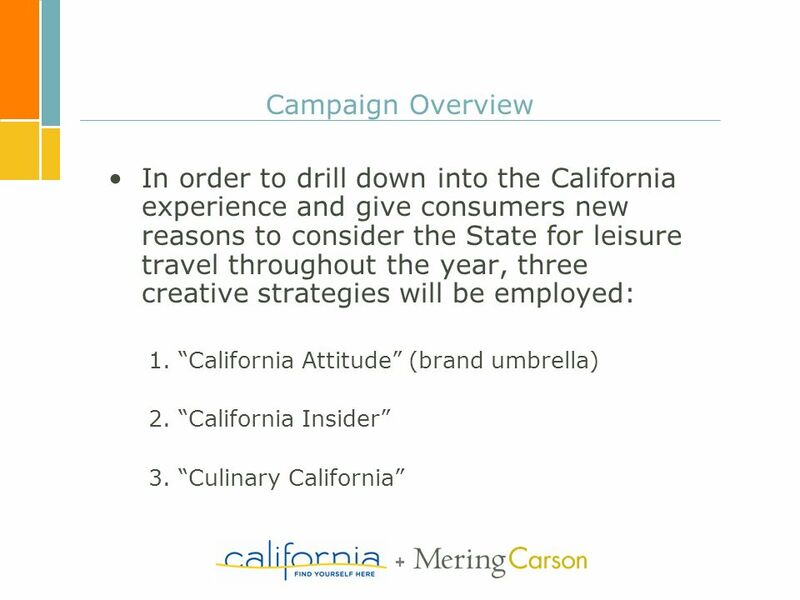 6 + Brand Advertising Objectives Facilitate top-of-mind awareness of California as a premiere travel destination – seed the consideration process that leads to visitation. Generate acceptance of and preference for California – connect the States emotional benefits with would-be travelers. Drive traffic to the website – encourage consumers to take action. 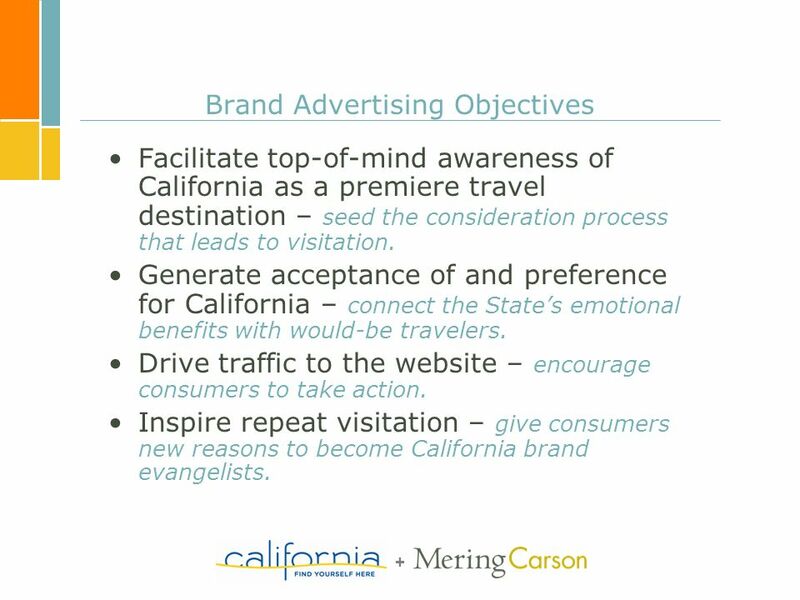 Inspire repeat visitation – give consumers new reasons to become California brand evangelists. 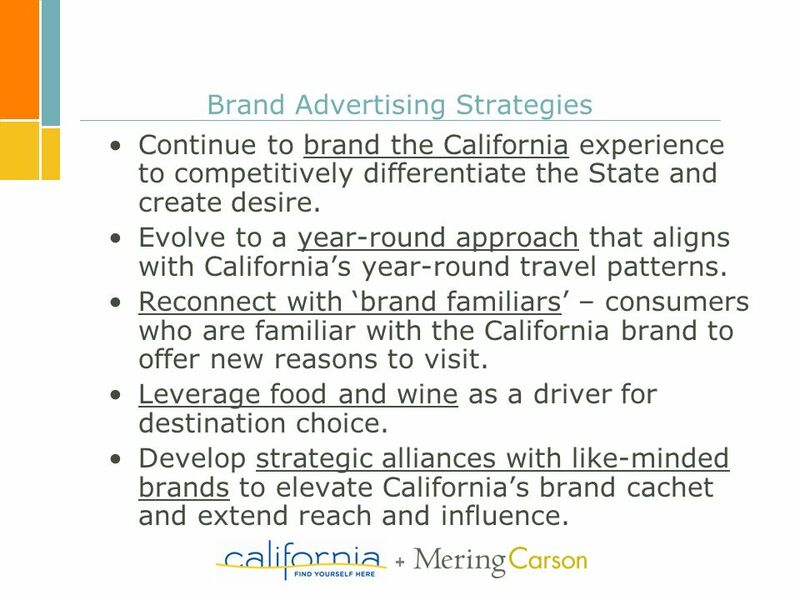 7 + Brand Advertising Strategies Continue to brand the California experience to competitively differentiate the State and create desire. Evolve to a year-round approach that aligns with Californias year-round travel patterns. 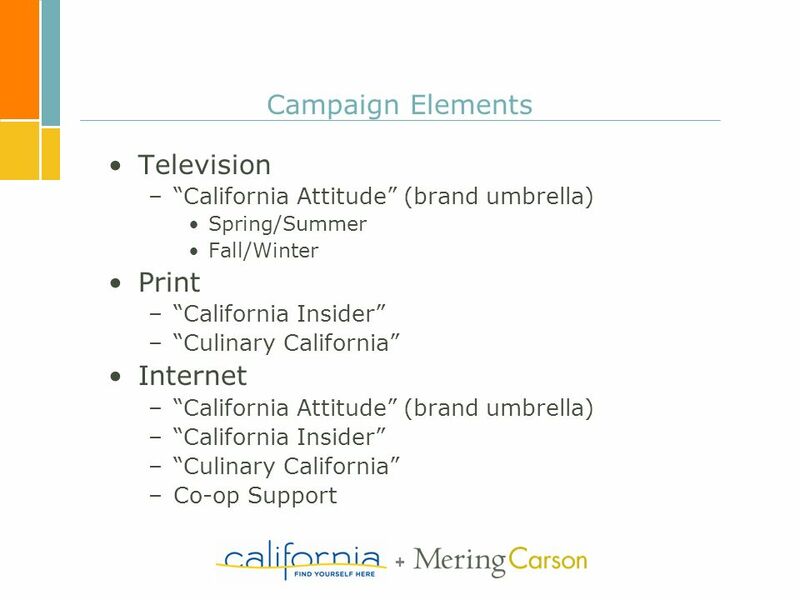 Reconnect with brand familiars – consumers who are familiar with the California brand to offer new reasons to visit. Leverage food and wine as a driver for destination choice. Develop strategic alliances with like-minded brands to elevate Californias brand cachet and extend reach and influence. 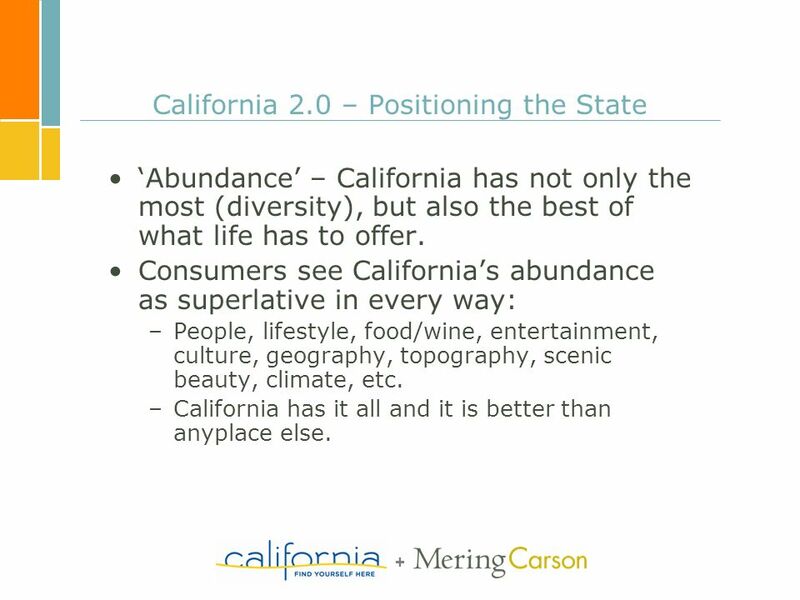 8 + California 2.0 – Positioning the State Abundance – California has not only the most (diversity), but also the best of what life has to offer. 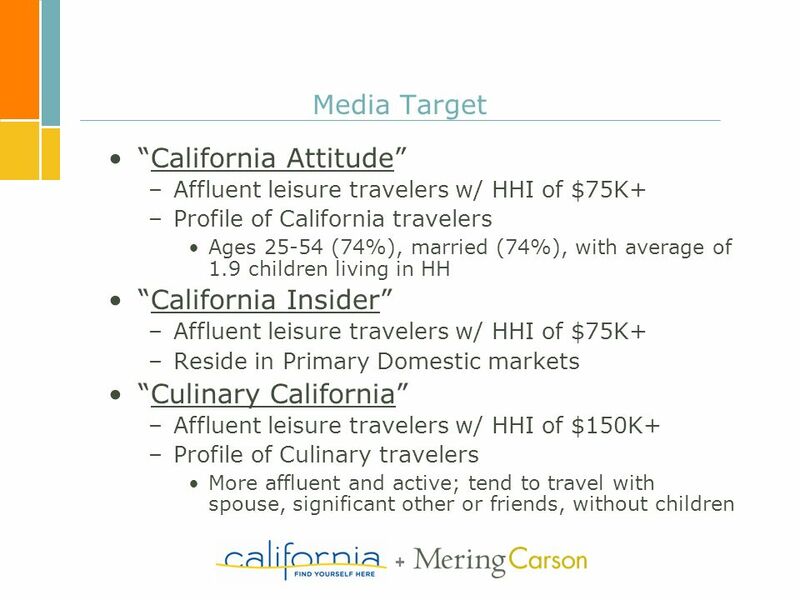 Consumers see Californias abundance as superlative in every way: –People, lifestyle, food/wine, entertainment, culture, geography, topography, scenic beauty, climate, etc. –California has it all and it is better than anyplace else. 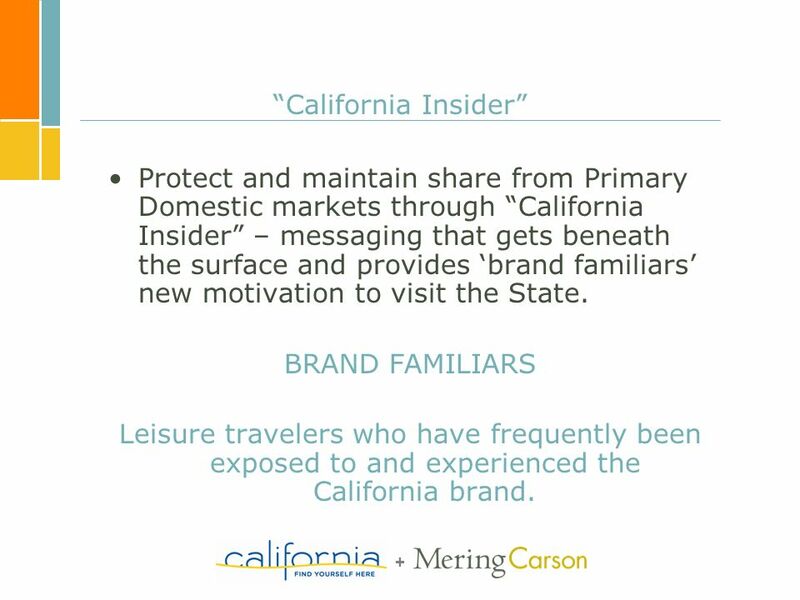 12 + California Insider Protect and maintain share from Primary Domestic markets through California Insider – messaging that gets beneath the surface and provides brand familiars new motivation to visit the State. 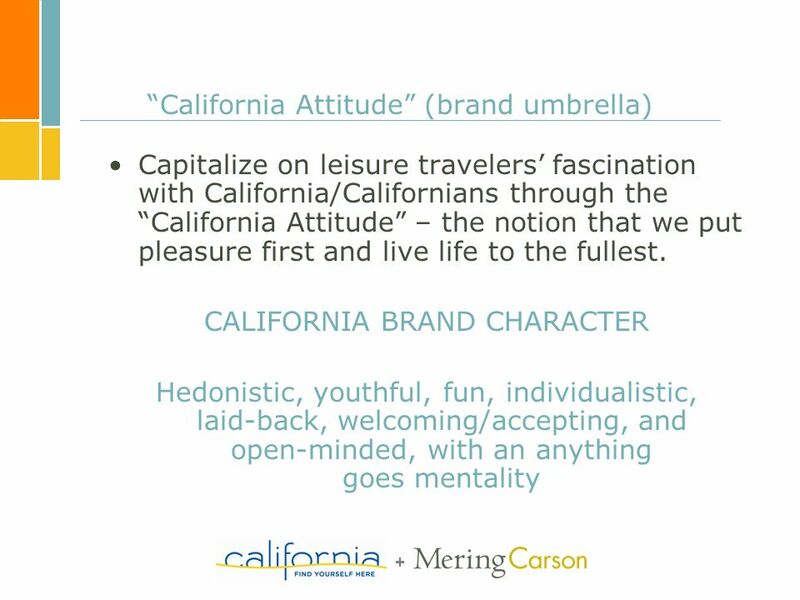 BRAND FAMILIARS Leisure travelers who have frequently been exposed to and experienced the California brand. 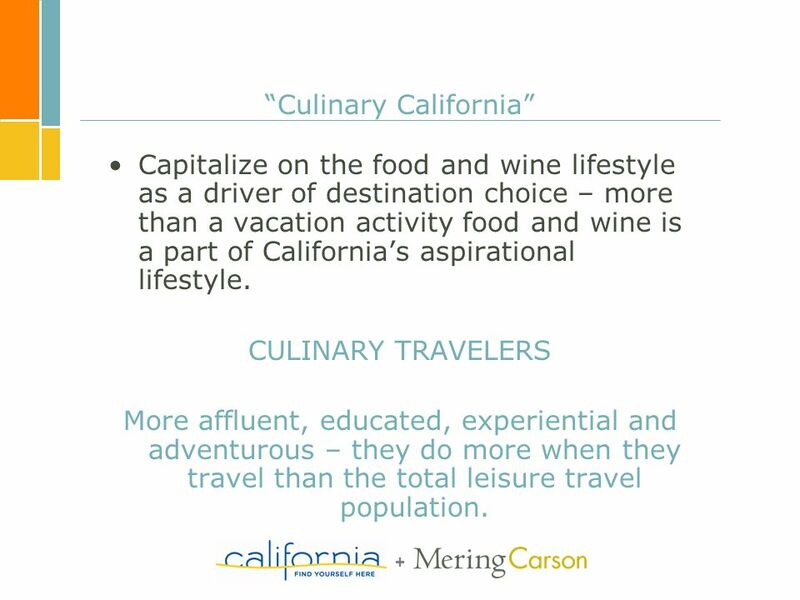 13 + Culinary California Capitalize on the food and wine lifestyle as a driver of destination choice – more than a vacation activity food and wine is a part of Californias aspirational lifestyle. CULINARY TRAVELERS More affluent, educated, experiential and adventurous – they do more when they travel than the total leisure travel population. 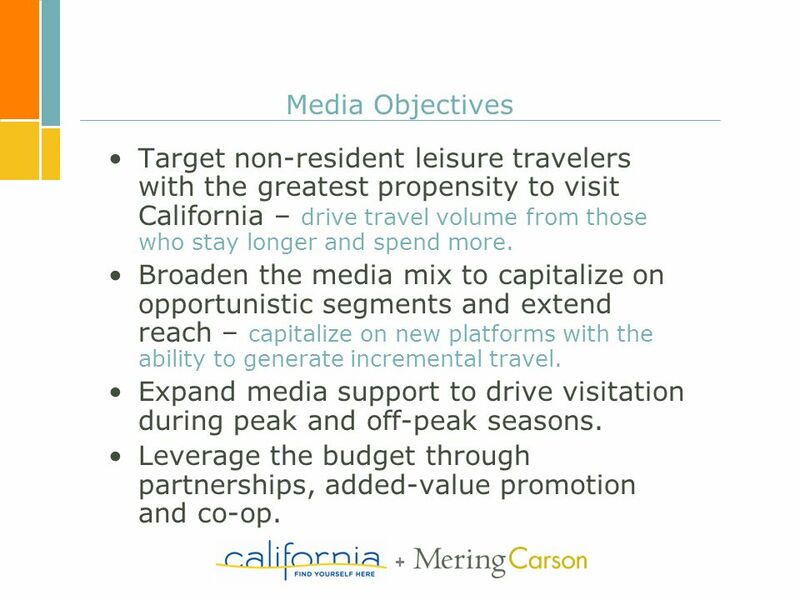 15 + Media Objectives Target non-resident leisure travelers with the greatest propensity to visit California – drive travel volume from those who stay longer and spend more. Broaden the media mix to capitalize on opportunistic segments and extend reach – capitalize on new platforms with the ability to generate incremental travel. Expand media support to drive visitation during peak and off-peak seasons. Leverage the budget through partnerships, added-value promotion and co-op. 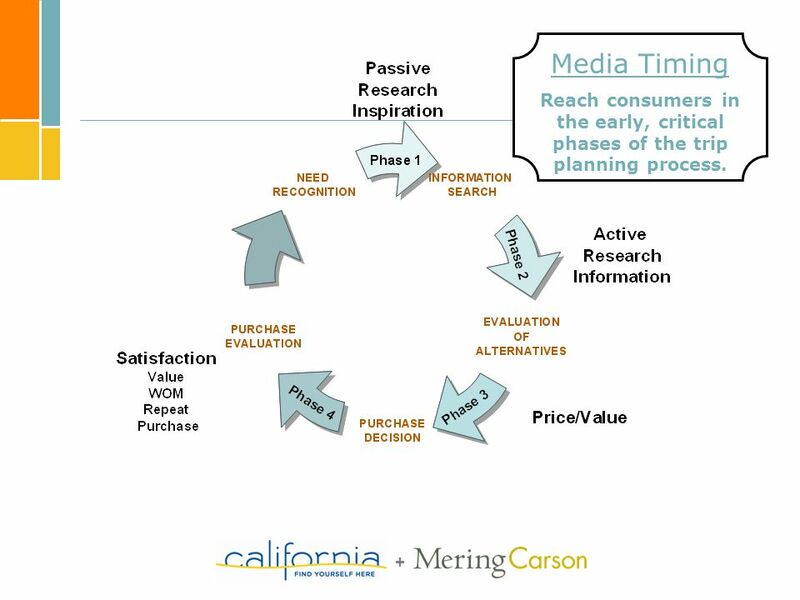 18 + Media Timing Reach consumers in the early, critical phases of the trip planning process. 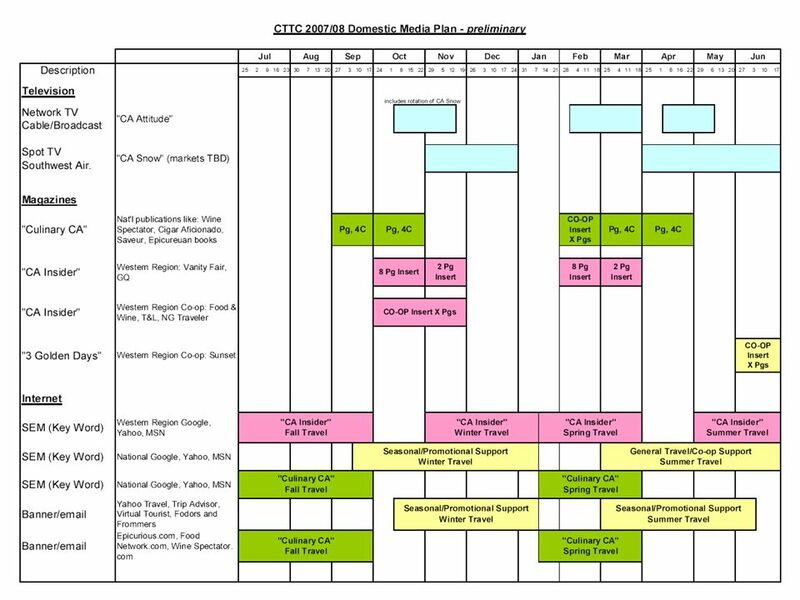 22 + Co-op Initiatives In conjunction with CTTCs new funding and ability to develop long-term strategic plans, co-op efforts will exist to accomplish the following: 1.Extend the reach of the brand platform. 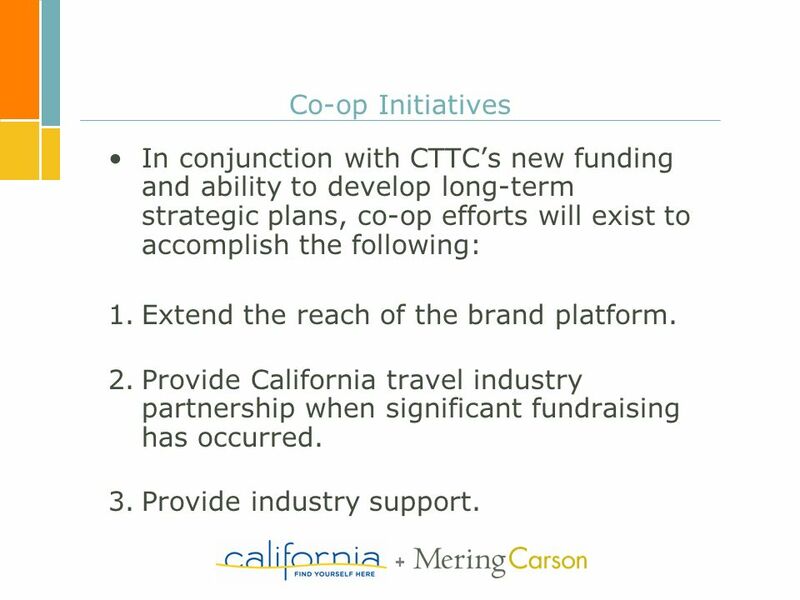 2.Provide California travel industry partnership when significant fundraising has occurred. 3.Provide industry support. 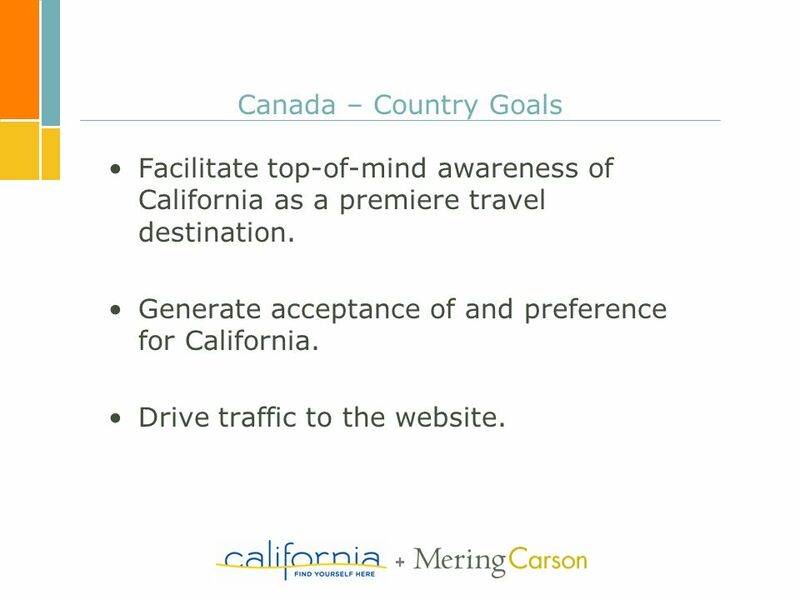 25 + Canada – Country Goals Facilitate top-of-mind awareness of California as a premiere travel destination. Generate acceptance of and preference for California. Drive traffic to the website. 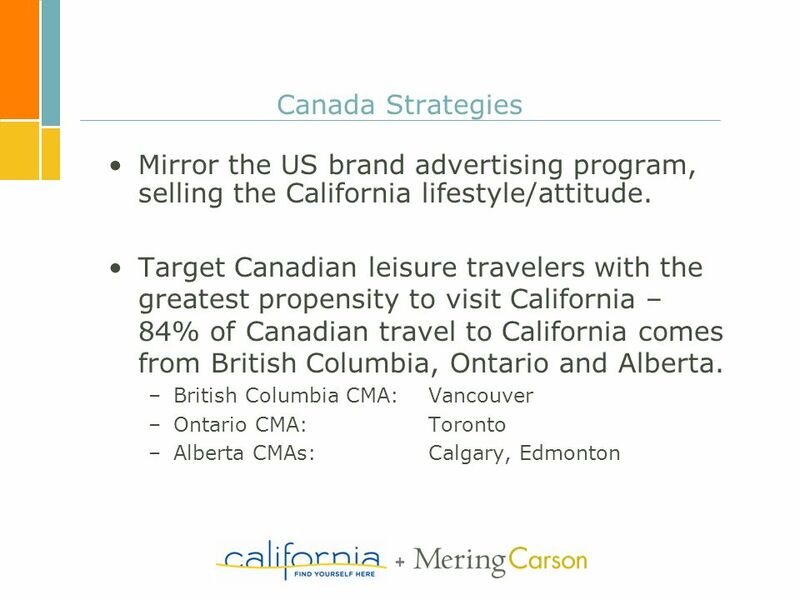 27 + Canadian Strategies (cont.) Concentrate efforts to promote travel in 4th and 1st quarters when volume it is the highest from these province. 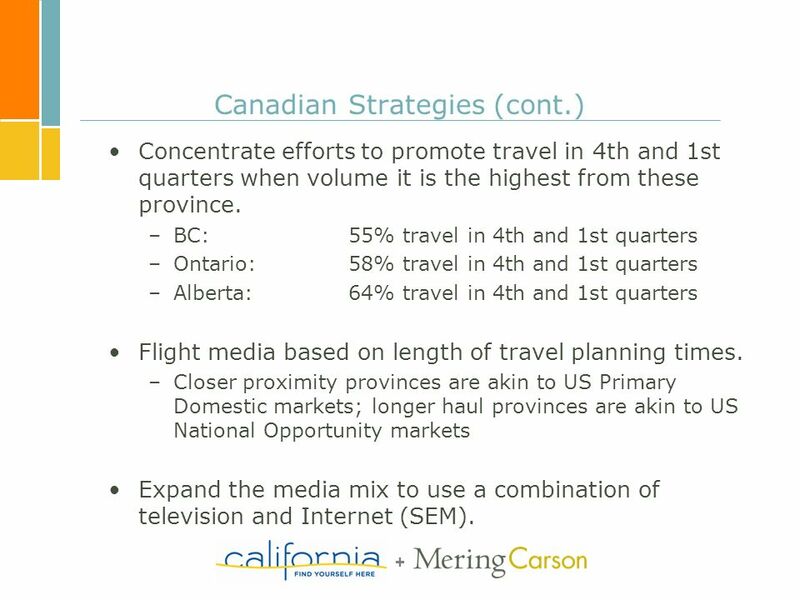 –BC:55% travel in 4th and 1st quarters –Ontario: 58% travel in 4th and 1st quarters –Alberta: 64% travel in 4th and 1st quarters Flight media based on length of travel planning times. 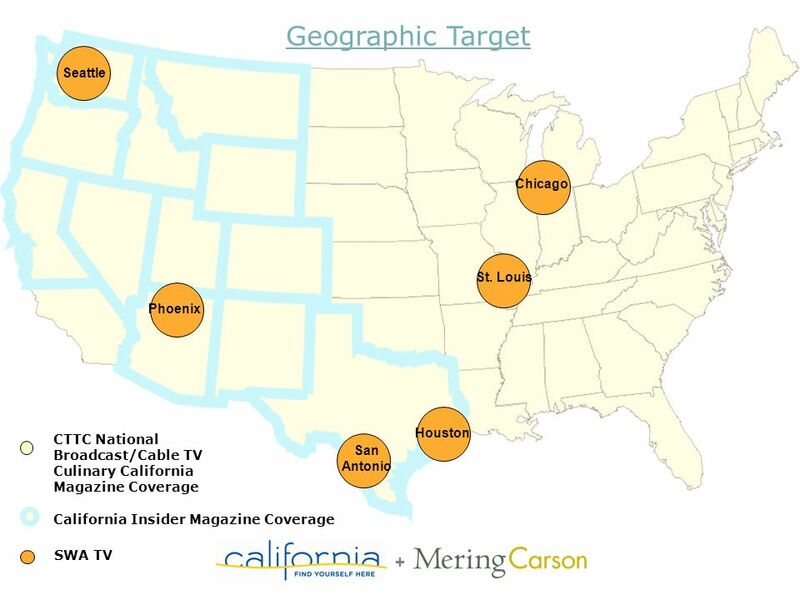 –Closer proximity provinces are akin to US Primary Domestic markets; longer haul provinces are akin to US National Opportunity markets Expand the media mix to use a combination of television and Internet (SEM). 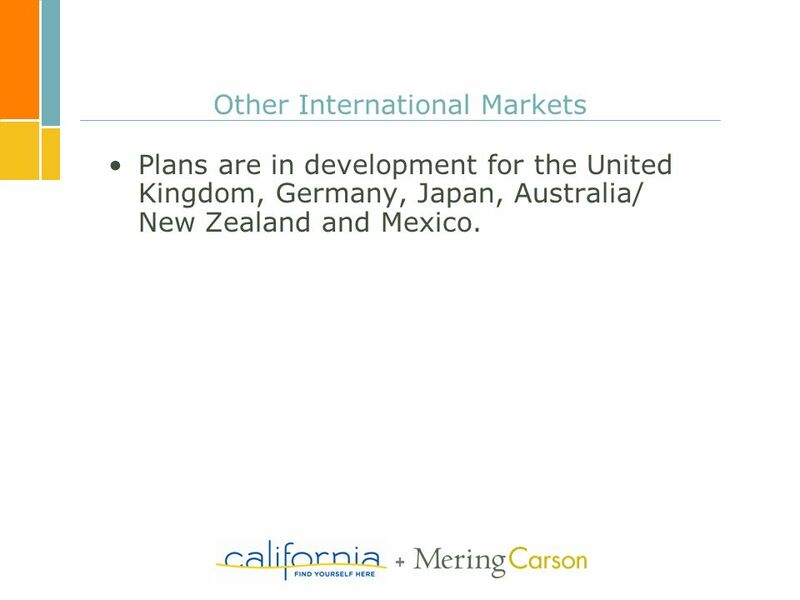 29 + Other International Markets Plans are in development for the United Kingdom, Germany, Japan, Australia/ New Zealand and Mexico. 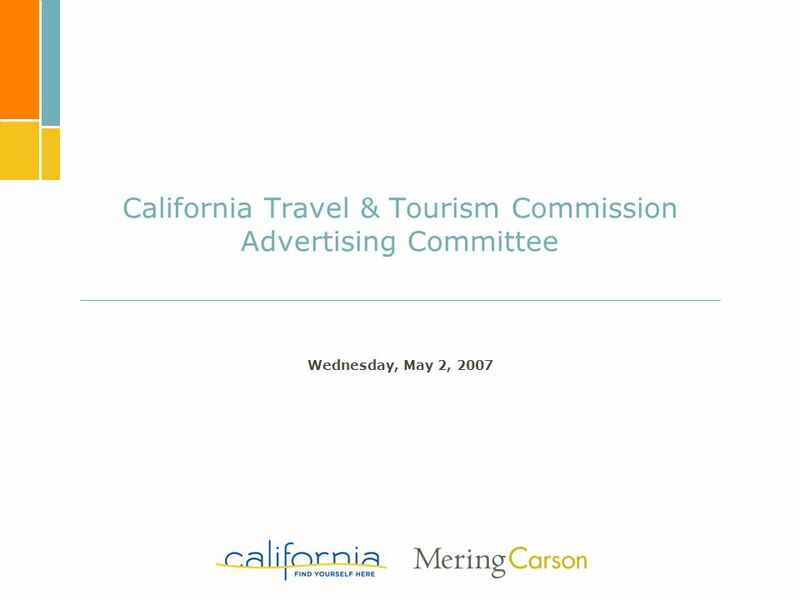 Download ppt "1 California Travel & Tourism Commission Advertising Committee Wednesday, May 2, 2007." 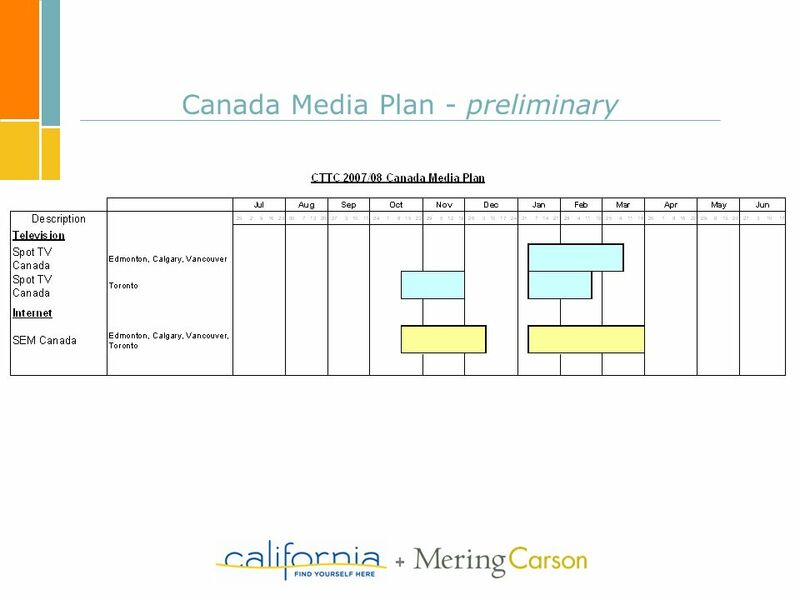 Media Planning Client provides relevant information to agency in the form of a media brief. 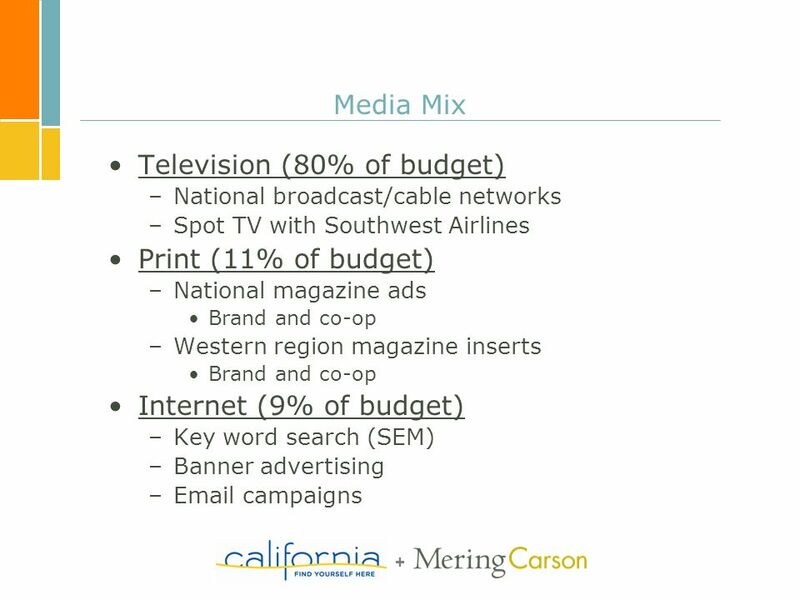 Market Profile Brand Media Profile Competitor Media Usage Target. Strategic Marketing & Research, Inc. UK Market Return on Investment Topline Summary December 2008. Travel Options Marketing Campaign Changing Travel Behavior, One Trip at a Time Because it matters Summit Meeting - August 22, 2005 Drive Less/Save More. Modern Media Planning Chapter 5. Modern Media Planning Setting Media Objectives Deciding Media Strategies Choosing the Media Mix Charting the Tactical. Powers of Television Advertising Television advertising is the most influential and compelling form of commercial communication available to advertisers. 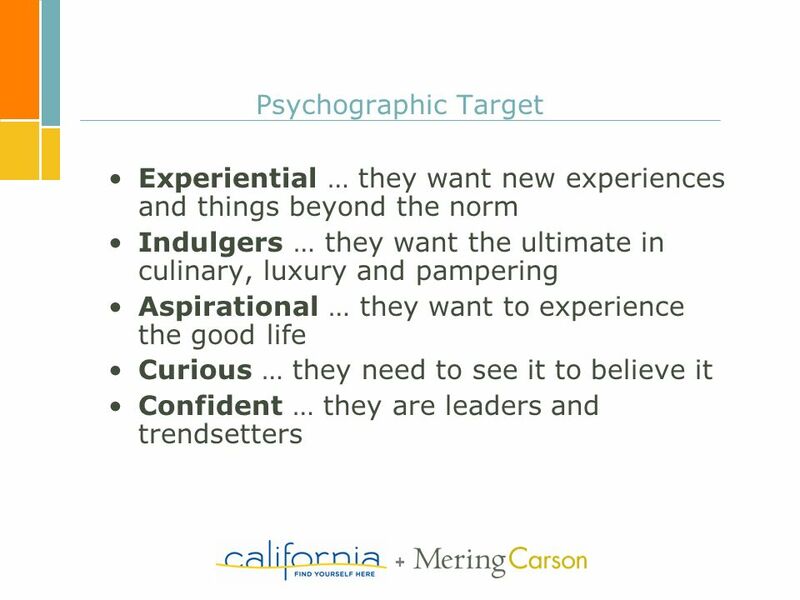 Tourism Trends & Ideas on How to Leverage Them Christina Lenkowski 1. 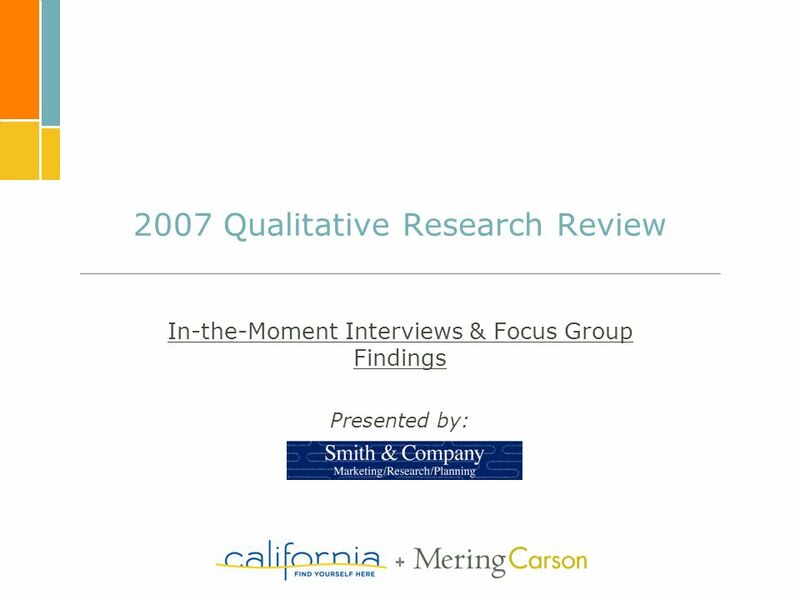 Chapter fifteen Media Planning and Buying McGraw-Hill/Irwin Essentials of Contemporary Advertising Copyright © 2007 The McGraw-Hill Companies, Inc. All. Multichannel Personalization At Scale: Building Incremental Value With #dunnhumby. MRI Essentials. MRI: Who Are We?  MRI (Mediamark Research & Intelligence) is the leading provider of multimedia audience research data in the United. A target market is a market segment that a company directs marketing effort toward in order to attract potential customers to buy its products/services/ideas. Missouri Brand Awareness & Destination Audit Study Fall 2003 Presented to: Missouri Association of Convention & Visitors Bureaus June 8, 2004. 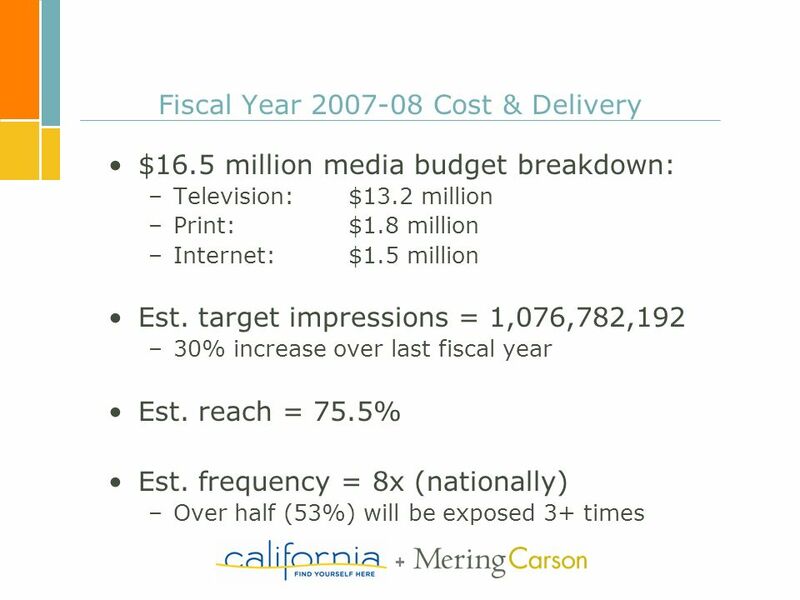 © 2006 Pearson Education Canada Inc. 7.1 Canadian Advertising in Action Chapter 7 Media Planning Essentials. 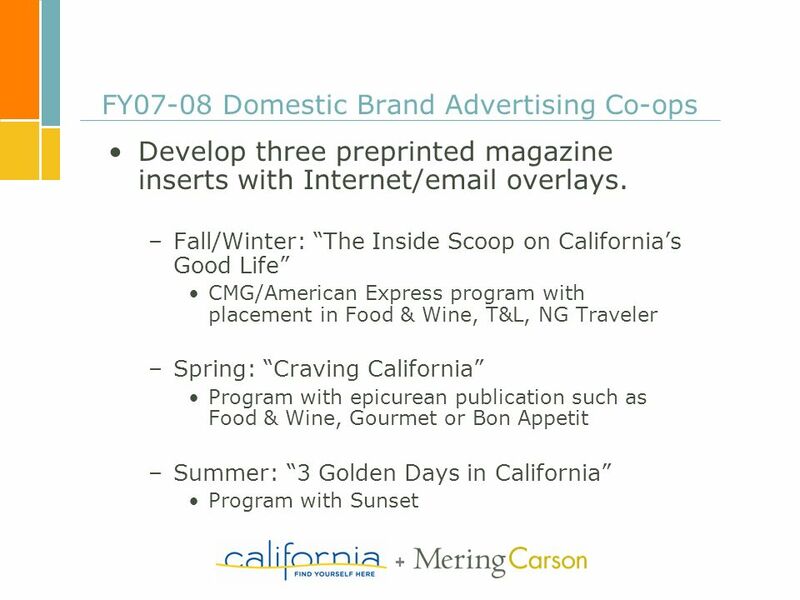 Co-op Strategy and Restructure May 19, 2008 CA Travel & Tourism Commission. Basic Components (see Media Workbook #26) 1. Reach, Frequency (and GRPs & GIs) & effective reach/frequency, if desired 2. Continuity (advertising timing. Why Invest in Travel and Tourism. agenda for today why we are here? Industry Update Research Findings Why Invest? 1. Hubspot Partner Success Workshop Creating a Sales Funnel and Inbound Marketing Strategy for the Travel Vertical 1/24/13. YuMe Online Video Analysis CREATIVE BEST PRACTICES AND MEDIA TACTICS FOR ONLINE VIDEO.